Opened in 1962, the 311-acre Rocklin Campus of Sierra College is nestled in the Sierra Nevada foothills minutes from Sacramento along Interstate 80. 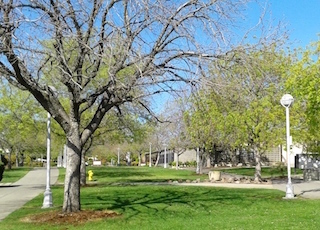 The campus is located in South Placer County, one of the most rapidly growing areas in California. More than 50 buildings dot the campus, ranging from classrooms to technology laboratories to student centers. The four-story Learning Resources Center is the most visible structure. The Standing Guard Memorial Garden is a highlight. This Japanese-style garden was built in remembrance of Placer County Japanese Americans who were interned during World War II and to honor Japanese American veterans. The Sierra College Natural History Museum has one of the most extensive regional collections of natural history and scientific displays. Campus nature trails wind through 70 acres of local foothill oak woodland and the streamside communities along Secret Ravine. Visitors may refresh their spirits by observing birds; enjoying the sounds of a babbling brook; hearing the rustling of the wind; and spotting local animal life. The trail's vernal pools include those made from 19th century gold excavation sites in the northeastern portion of the campus, and a man-made demonstration pool near the cactus and rock garden of Sewell Hall. The Sierra College West Arboretum maintains a living collection of Californian native plant specimens and the East Arboretum hosts a wider variety of horticultural and worldwide species. Directions: From I-80 east, exit at Rocklin Road and turn right, heading east on Rocklin Road. Go about a quarter mile and turn left at El Don Drive/Campus Drive West. Follow Campus Drive as it bears right. At the third stop sign (next to lots G and F), turn left on Center Drive and then park in lot B or C. There is no fee to park on the weekends! Look for orienteering signs to the meeting place. From Highway 50, take the Hazel Avenue exit and proceed north approximately 10 miles. Hazel Avenue will change into Sierra College Boulevard at Douglas Boulevard. Proceed on Sierra College to Rocklin Road. Turn left onto Rocklin Road. Sierra College will be immediately on your right. Here is the Sierra College website. A Google map to the college is here.